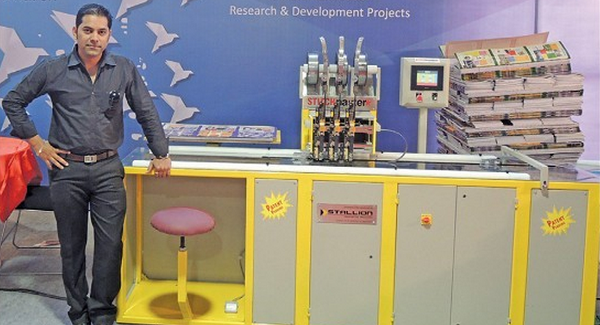 For the 10 year old Mumbai-based Stallion Innovative Machines, participation at drupa is a leap of faith and confidence. It is the first participation in an international exhibition and aims to further the Stallion brand in the Post -press world. Stallion is launching its latest M30 STITCHmaster+TAPEmaster (Programmable Heavy Duty Wire Stitching & Spine Taping Machine): Solution for stationery line. M-30STITCHmaster is made with technical collaboration between Deluxe Stitcher International, USA and Stallion Innovative Machines, India. It is an auto-feed, Programmable wire stitching machine that produces books, perfectly stitched at exact location, set in the touchscreen HMI with 20 programs memory. In addition, it will be displaying its PINmaster(Wire stitching machine) which can stitch upto 8mm thick book using Deluxe/Hohner Stitcher heads. The machine has a facility to attach flat or V beds for feeding as required. Stallion machines are heavy, sturdy & CE certified. We hope to attain maximum exposure in the international market making Stallion world class brand for post press solutions, said Alhad Gandre, the dynamic entrepreneur behind Stallion Innovative Machines.